5th excerpt from my two-man play REMOTE CONTROL. Did you ever feel like your life was interrupting the television commercials? Los Angeles 1980′s. Harold & Fred watch television: they become the characters they watch. Harold and Fred on the couch. Harold is transfixed by the TV; Fred is distracted trying to remember something with no luck. FRED: …Don’t you hate it when you try to remember someone’s name and it’s gone right out of your head. HAROLD: (quickly) Who were you trying to think of…? HAROLD: That’s a trick. Sometimes if you do that it might pop back in. FRED: No. Shhh! Wait a minute! It’s right on the tip of my tongue…What was his name? The one who died? HAROLD: I don’t know who you’re talking about. Anyway, that’s the first thing to go. Fred struggles to remember the name. HAROLD: (needling) Short term memory. Short term memory is the first to go. It’s all over. You’re as good as dead. Did you know, there’s a small fish – what was it called? I only read about it last week. Anyway, this small fish has a very short memory. It’s swimming about in this small tank up and down and around and every time this fish turns the same corner, it’s a brand new experience for it! So! There’s something good to be said for the loss. FRED: What are you rattling on about? HAROLD: Short term memory. It’s the first to go. There’s one other consolation though, isn’t there? HAROLD: Well, your long term memory supposedly improves with age. When you get even older and more senile, you’ll remember everything from years ago as if were yesterday. Unless you’re too busy trying to remember where you put the tubes that go up your nose. FRED: I was just thinking: if your short term memory fails when you’re young, how can your long term memory possibly improve? There’s obviously nothing to inform it. How does that work? HAROLD: I don’t know, it’s probably. FRED: (lights up) Henry Bringham! FRED: That’s the guy who died! Henry Bringham…or Bingham. HAROLD: Well? What about him? FRED: (lost) I don’t know, I can’t remember what I wanted to say about him now. 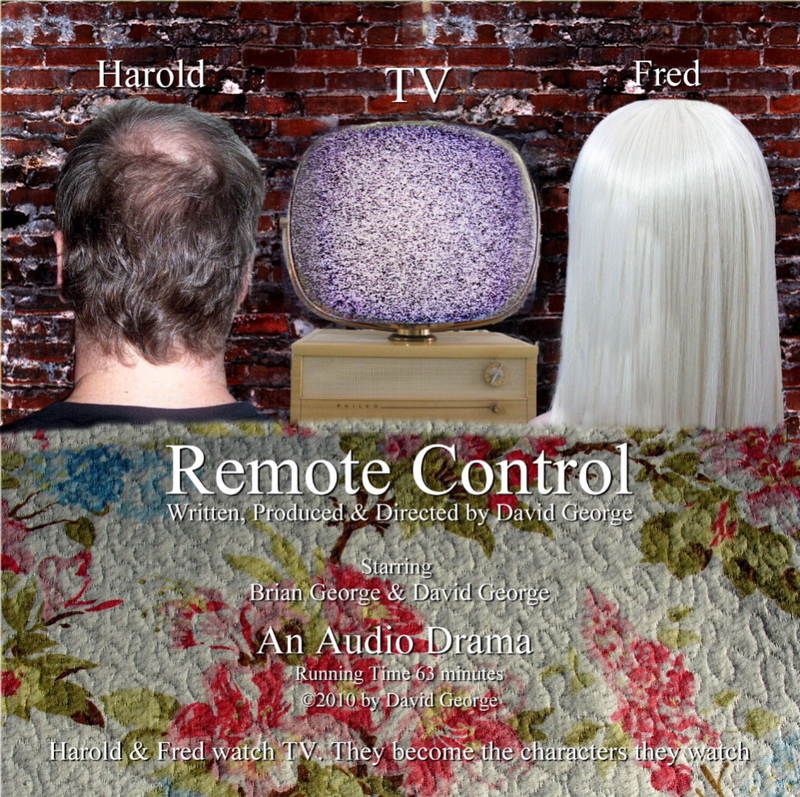 REMOTE CONTROL is available as an audio drama on iTunes, Amazon & Audible.com (US & UK) and recently aired on radio across Canada. 4th excerpt from my two-man play REMOTE CONTROL. Did you ever feel like your life was interrupting the television commercials? Fred and Harold sit on the couch wearing bathrobes. Fred, with his hair in curlers, scours the LA Times Help Wanted ads. Harold raises the remote and aims it at the TV (i.e.The audience). FRED: I can’t find a thing. Your unemployment check came today. Did you get it? FRED: How long do you think you can stand not working? HAROLD: It doesn’t bother me anymore really. HAROLD: That’s ’cause I’m ahead of my time. In the future there’ll be massive decreases in the working population, won’t there? Technology will’ve taken over eighty per cent production of the Gross National Product. The government will be forced to pay people not to work. FRED: Why would they do that then? HAROLD: They wouldn’t have much choice, would they? Could you imagine masses of hungry, desperate, people with no money? Crime would be rampant and uncontrollable. That’s why the government would be forced to pay people not to work. The government pays me not to work now. I’m ahead of my time. Pass me some chips then. Fred slides the chip bowl over to Harold. 3rd excerpt from my two-man play REMOTE CONTROL. Did you ever feel like your life was interrupting the television commercials? Los Angeles 1980’s. Harold & Fred watch television: they become the characters they watch. Harold is in his bathrobe and Fred is in his frock on the couch playing solitaire. HAROLD: It was her muddledheadedness that was the problem. FRED: Couldn’t follow a line of logic? FRED: …And does it by showing the atrocity. HAROLD: Well, of course. She would get so stuck on the idea that the film was glorifying violence by showing it at all, that she’d instantly dismiss this film that essentially agreed with her point of view. Well, you want to have a conversation with someone like that about what the film was all about but you can’t, can you? You get stuck in the debris of irrelevance. The rear projection screen comes to life with images of video noise. One image fades into the next to the tempo of the drumming and an intermittent buzz. All sounds reach a climax as The Local Evening News theme music fades in and the screen provides a suitable background for the news. An ANCHOR (Fred) sits behind a desk. This is an excerpt from my two-man play REMOTE CONTROL. Did you ever feel like your life was interrupting the television commercials?